The Florida Department of Education denied your application for a teaching certificate. It could for several reasons. Missing college classes, required experience, a past criminal issue, or a teaching certification problem in another state can cause your application to be rejected. Can I dispute a denial of teaching certification? Yes – a teacher can appeal the denial of a teaching certificate. However, I always advise hiring an experienced lawyer who represents Florida teachers to assist with the process. Criminal charges – Past DUI’s, child abuse accusations, criminal traffic citations, misdemeanors and felonies, if not explained correctly, can cause a teacher to be denied a certification. Certificate issues in another state – while Florida has reciprocity which allows you to transfer your teaching certificate from another state, if you had any discipline or even surrendered your teaching license, you could face a denial from the Florida Department of Education. Other teaching license application issues – Other issues like failing to disclose previous teaching certifications, past criminal charges, or not explaining an issue correctly can lead to a denial. What happens if I appeal my certification denial? The DOE will take another look at your application and the documentation supporting your challenge. This last chance at another look is why I strongly suggest hiring an attorney who represents teachers. The presentation of the material you are using to dispute the denial of your teaching certification is critical. The information and explanation of why you do qualify must be laid out and written clearly. You may not get a second chance. Can you help all Florida teachers that were denied a teaching certificate? Yes. I help all Florida teachers facing certification issues, including appeals and disciplinary action. Call me today for a free consultation and start protecting your professional future. 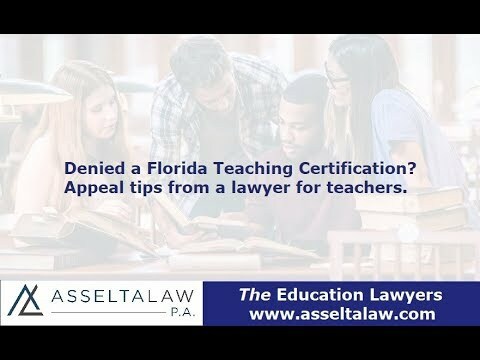 Richard Asselta is an award-winning lawyer who defends teachers throughout the state of Florida. Click here to read how he helps teachers with teaching certification discipline at the district and state levels, administrative DOE hearings, investigations, and certification denial appeals.